When you’re hungry on your commute, you get angry easily. Stop it from happening with 50% off a Snickers bar. Just watch the video by clicking the link below and screenshot the barcode at the end to redeem your discount at any 7-Eleven. Anda jenis panas baran bila lapar? 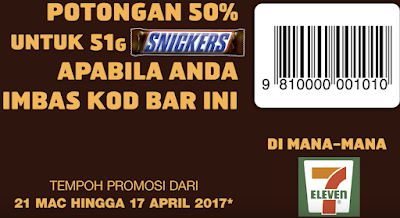 Makan Snickers, confirm tak akan menggelabah. Tonton sampai habis untuk ketahui kejutan daripada Snickers!